Day Three was mostly a restful and un-eventful day. We moved rooms (this would be second of our total three room changes), but this was a planned "upgrade" (re: upsell when we got here) that gave us access to the premium "Chef's Plate" restaurant. 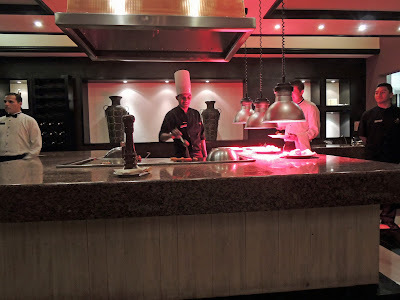 This was the restaurant that required an upcharge of $80 per person and you had to dress nice (that's what they said but it turned out some people didn't do that). With the room upgrade all reservations at this restaurant were then free so we decided to check it out, after all we'd already paid for it. 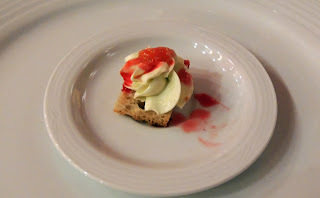 The Chef started us with an amuse bouche of whipped cheese with red bell pepper and a strawberry sauce over garlic crostini. 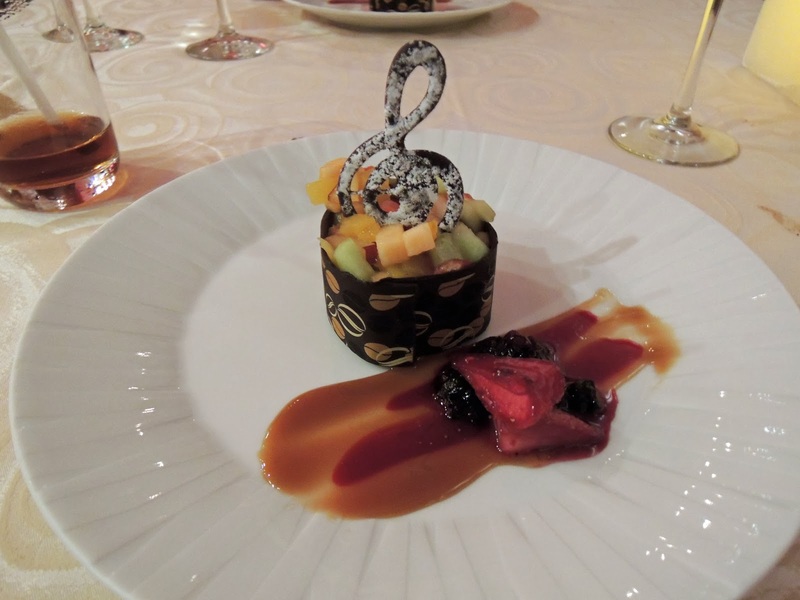 The bell pepper's flavor was well incorporated into the smooth mousse and the tart strawberry sauce helped cut the richness of the cheese. 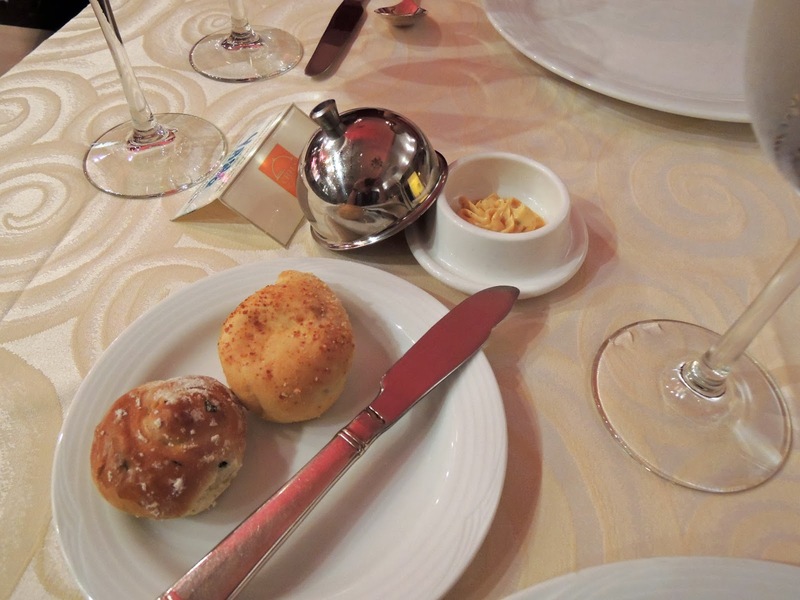 For bread side we were presented with a Chipotle wheat bread and a brioche with cream cheese in the center. 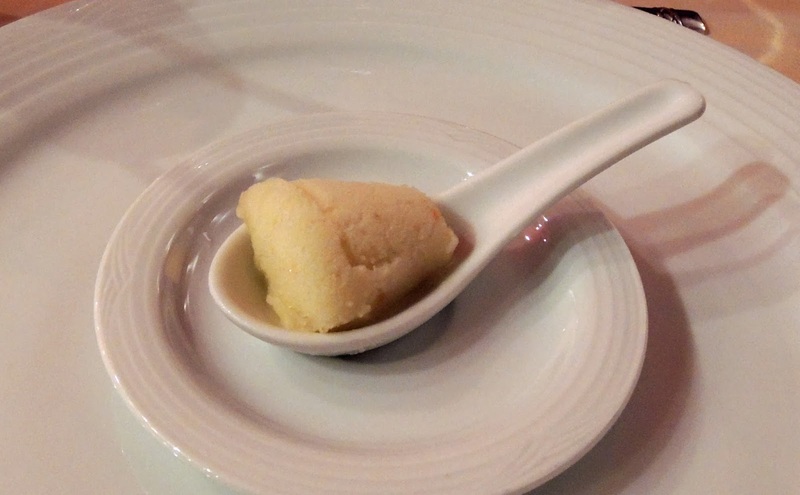 It was served with a compound butter made of garlic paprika and cognac. The table had some flavored salts to accompany the meal. I couldn't tell what the salts were made of but I saw in other restaurants salts flavored with various wines, strong possibility. I'm not a carb/bread person but I made an exception for these delights. Onto the first course: Grouper Fillet au Pesto. 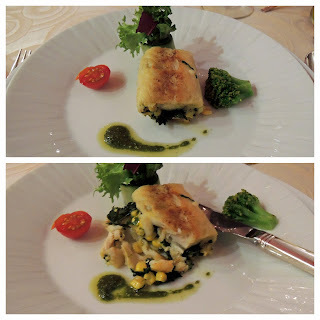 The bottom picture shows you that the grouper was stuffed with corn, spinach and a bit of goat cheese. The fish was very flaky and tender. The dish was very lightly seasoned so the pesto could stand out. 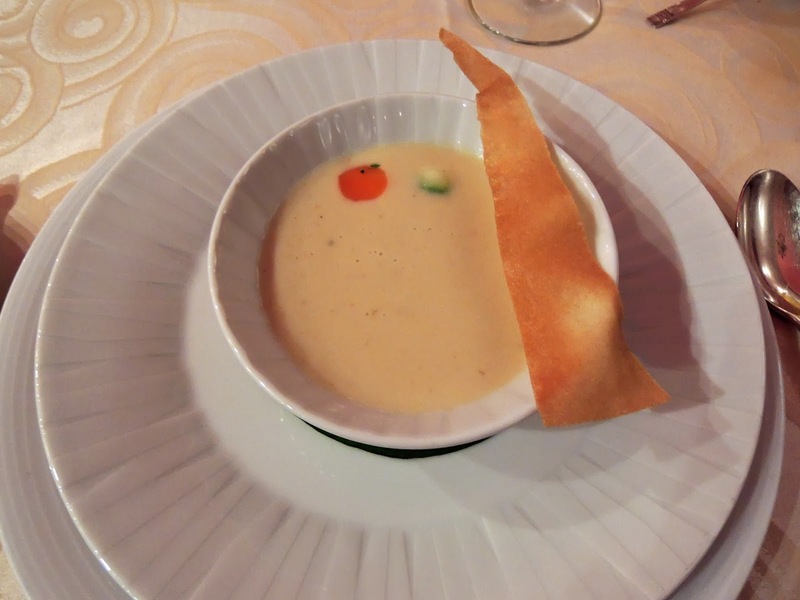 The soup course was a Spicy Cream of Gorgonzola with a bit of zucchini and carrot. I loved the presentation of zucchini and carrot half spheres. The soup was delicious, no overwhelming blue cheese or heavy cream texture. Despite the name I can only describe this as a light delicious cream soup. For a palate cleanser we were served with a guava sorbet. 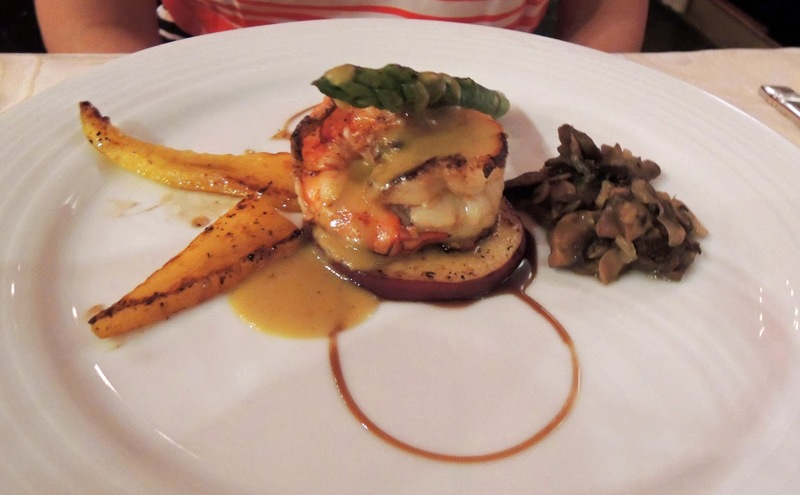 The first entree was the Giant Shrimp Temptation, it was served with a green curry over a grilled slice of apple. The shrimp was well cooked and curry sauce went surprisingly well with the grilled apple and yellow bell pepper. It was accompanied with some sauteed mushroom. 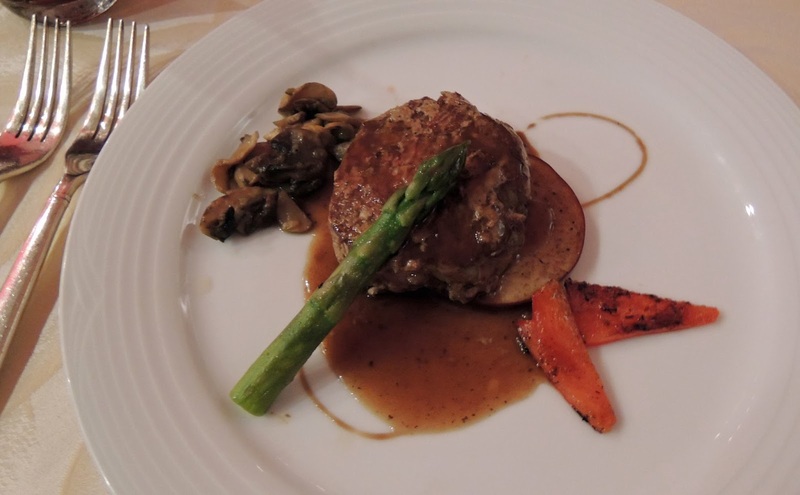 The restaurant was very accommodating when I asked about an alternative to the shrimp (I was ready to go sans shrimp) for the entree and they provided me with a Beef fillet served with a red wine reduction. It was very nice of them to prepare a separate plate for my entree, being a fixed menu they get some sense of scale when they can prepare flights of the same dish all night long. Even with the curve ball the chef pulled the dish off and served it at the same time as my wife's as if it were part of the tasting menu. Second Entree was a "Pork Loin Crystal Au Pink Peppercorn". The plate didn't match the menu no pasta here there must have been an audible called at the last second. 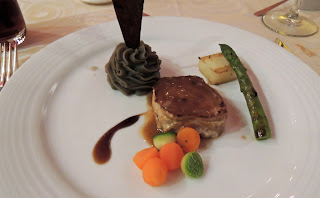 The pork was glazed in an apple balsamic sauce with the half sphere carrot and zucchinis, toasted potato with basil and accompanied with a Portabello mashed potato. My only complaint here is that they tend to overcook their pork (especially chop/loin) I think because of the old rules of cooking over 165F internal temp (USDA has since ruled it to be the same as beef 145F with 3 min resting period) this isn't just this restaurant but each of the ones where we had pork. The Portobello mashed potatoes were very interesting, earthy mushroom flavor in potato is pretty new. "A+" for something new (to me) I'm not even sure how they did it? Did they cook and puree the mushroom into a liquid and mix it in? I'll have to try and figure it out. Finally we had a "Cheese Symphony" for dessert, medley of tropical fruit over a "fluffy" cheese cake served with a raspberry white wine and caramel sauce. 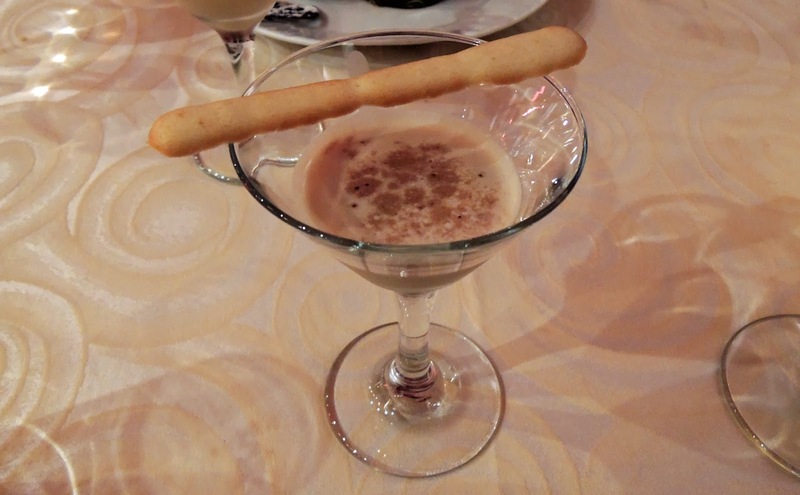 I guess the symphony part was the dark chocolate garnish. The dark chocolate was a good balance to the sweet cake but after all the food before I was only able to get in one bite. 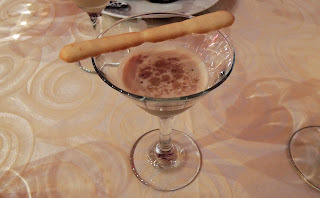 The bartender surprised us with a tiramisu martini, the cookie tasted a lot like lady finger and dipped in the cream martini tasted exactly like a tiramisu. The presentation and service were amazing. We really enjoyed ourselves and loved it so much we immediately booked the rest of our dinners here!